Wow, we did it! 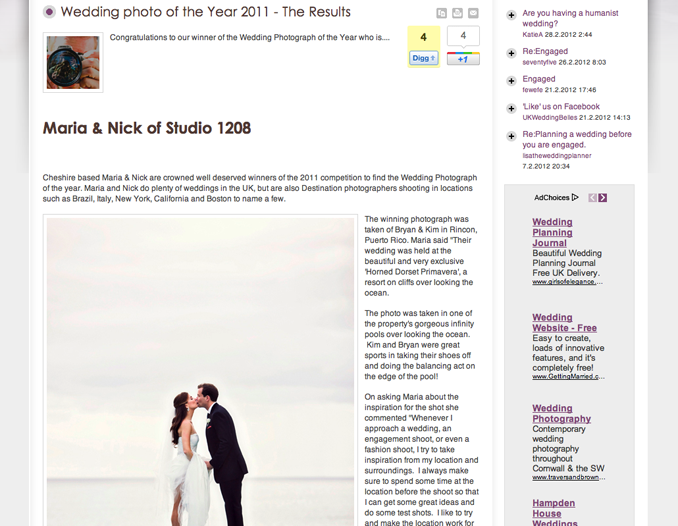 I can not believe that we were voted best wedding photo of the year in the UK! I can not tell you how excited and proud I am of STUDIO 1208. We want to personally thank everyone who voted for us, our families and friends who helped get the word out tirelessly, to UK Wedding Belles for hosting the competition, to Bryan + Kimberly for being so beautiful, to Amy Nichols for coordinating / designing such a beautiful wedding, and to all the blogs / pinners that have featured this wedding and image. So, what did we win, you ask? Well, I'm glad you asked...we won a fantastic title, an awesome interview and a free listing on UK Wedding Belles. Free advertising is always amazing, and we are thrilled. Please pop over to UK Wedding Belles to read our interview. CONGRATS!!!! You sooooo deserved it.